It gives me great pleasure to welcome you to our school website. Our hope is that you will find this site useful, and that it gives a flavour of some of the things that are happening in our school. Our motto: Celebrate, Believe, Aspire is important to us and so too our eight values : Perseverance, Courage, Compassion, Justice, Respect, Forgiveness, Trust and Selflessness. Through our daily interactions, our teaching and learning we strive to commit to these values, which are rooted in our Christian heritage. We know our children at Pimperne are capable of achieving great things and we aim to support the aspirations of each individual, to help them to believe in themselves, support and nurture their experiences and succeed in all they strive for. We aim to create an environment where each child feels safe to have a go and know that they are also, on occasion, safe to fail. For we do believe that it is through our experiences and mistakes that we learn and become determined to persevere for what is important to each of us. 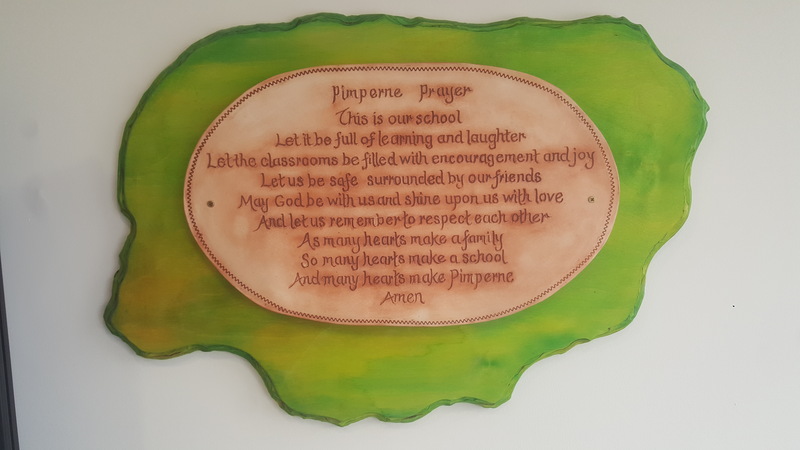 The strong family ethos here at Pimperne, coupled with the Christian tradition of the school, makes an important contribution to the development of all our children. Thank you for showing an interest in our school. We would be delighted to welcome prospective families to Pimperne Primary, as we are proud of everyone of the individuals that makes our school what it is. To find out more, please contact the School Office for further specific information, to make an appointment to visit us or to find out the details of our next Open Morning. Our school is located in the heart of the small village of Pimperne in Dorset. We are very much a community focussed school with a large number of our pupils living in the village itself.